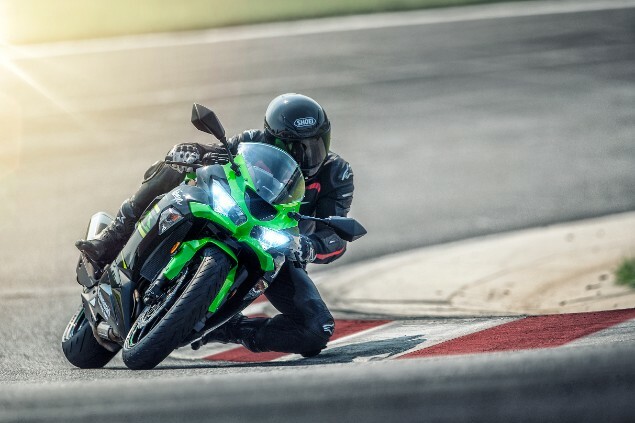 The drop in global sales in the 600cc supersport class has been incredibly steep with around 80% fewer bikes being sold than at their peak but that hasn’t stopped Kawasaki giving the ZX-6R a makeover for 2019. While some were predicting the death of the supersport class just a few years ago, Kawasaki has joined Yamaha in updating their class offering and the Kawasaki has been given a fairly comprehensive update. The Kawasaki ZX-6R has, for some years now, been alone in the class by actually having an engine that is 636cc and not 599cc like the rest. What this means for future racing eligibility remains unclear but previously Kawasaki separately developed a 599cc ZX-6RR model specifically to go racing with. There’s no word on this happening again at this stage. It appears many of the changes being made to the 2019 Kawasaki ZX-6R are aimed at making it a better road bike rather than more track focussed. This includes the new shorter gearing which will give the feeling the bike has more low-down torque and improve low-rev response. While the basic engine, chassis and running gear of the ZX-6R remain fairly similar to the outgoing model, the bike has been given a completely new look which takes big cues from the larger ZX-10R model. The engine has now been modified to conform with the Euro4 regulations that were introduced at the start of 2018 but Kawasaki is stating the bike’s power and torque remain unaffected at 130PS without the additional powerboost Kawasaki always claims comes with the Ram Air effect. 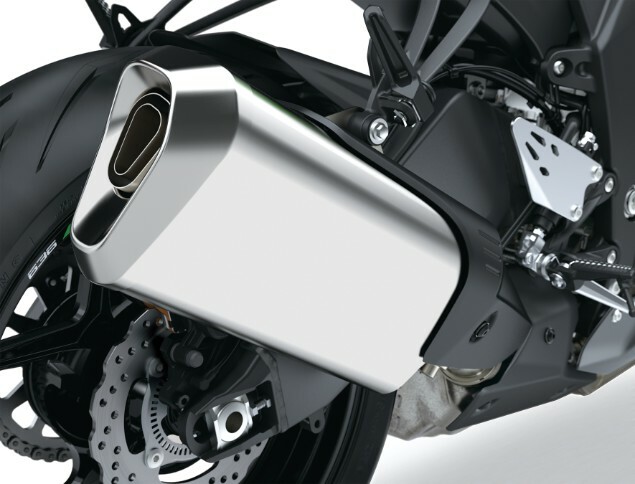 A new design of exhaust silencer is a visible sign of the work done to pass Euro4; as are the front fork-mounted orange reflectors which are a legal requirement. The front fairing is all-new and features new twin LED headlights and a large, centrally-mounted air intake which works to reduce the distance air entering the airbox needs to travel. The tailpiece of the bike is also of a new design and houses an LED rear light. 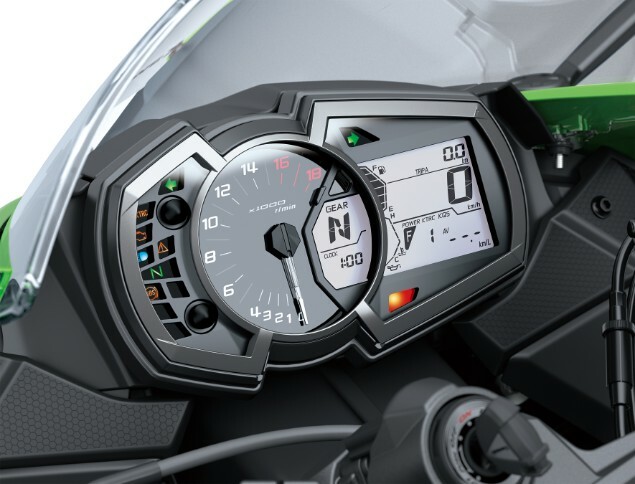 Also new for 2019 is the fitment of a quickshifter that allows for clutchless gearshifts along with an all-new dashboard which features a large, central revcounter and it also adds a fuel gauge and range indicator for the first time; another nod to road use. 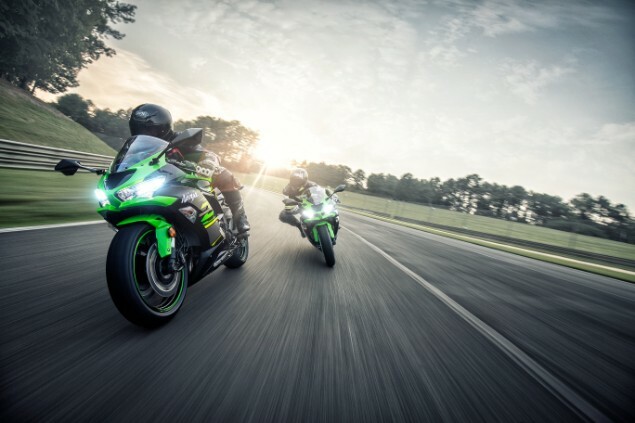 Bridgestone has now equipped the ZX-6R with the very latest sports tyre in the form of the Battlax Hypersport S22 which is said to offer lighter handling and increased grip in wet and dry conditions. Two colours will be available; the traditional Kawasaki racing green and black.